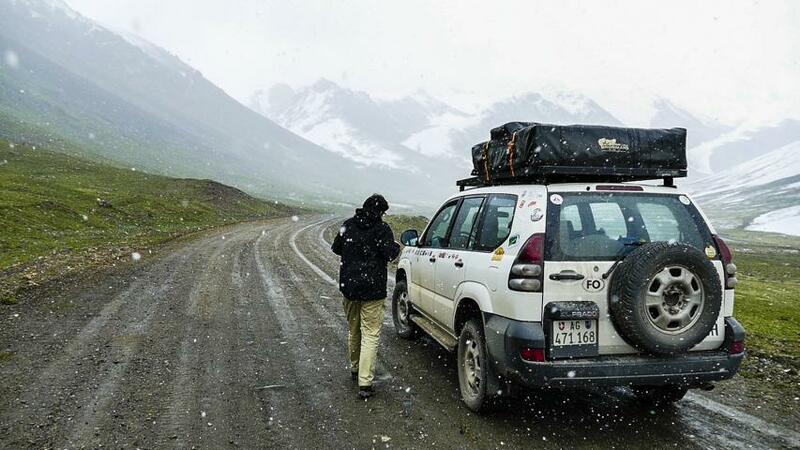 After having driven more than 8000km thru rather flat land we reach Kyrgyzstan. Famous for not having too much plains. Just mountains – up to more than 7000m altitude – among them Pic Lenin. And winding roads – leading up to passes of nearly 4000m. The much needed environment for us to recover from all these historic buildings we visited in the last weeks. 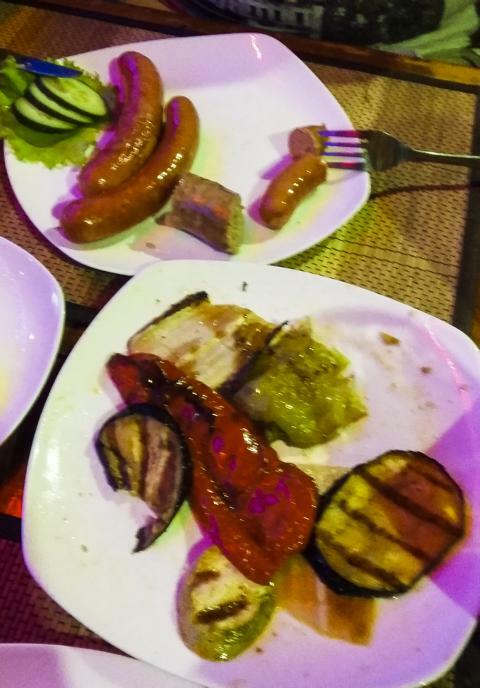 Our last evening in Fergana, Uzbekistan. 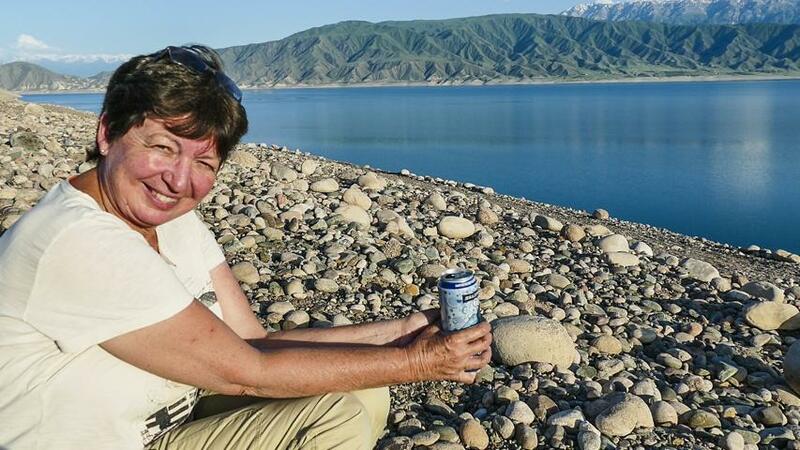 A fat Russian dinner, a couple of watery Uzbek beers – and we’re ready for Kyrgyzstan. The next morning we spend the last few 10 000s of Som in a supermarket and we’re on the road to Osh. Some 3h to the border, a road with a lot of traffic and potholes. But also a 1st glimpse of the mountains over the border in Kyrgyzstan. The border: what a difference to the 1st 1 we entered a few weeks ago. It’s nearly empty. Immediately a guy opens the Uzbek entrance gate. We pass all this admin. nonsense every border post offers to its customers. Quickly we open a door of Prado to allow the obligatory intense search – and that’s it. 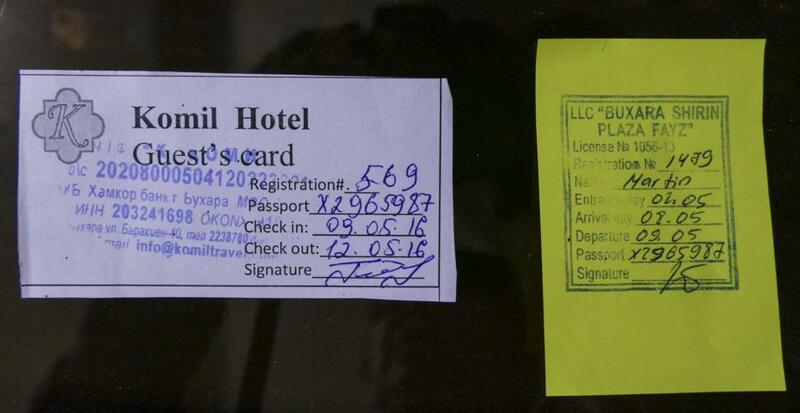 Nobody is interested in any registration slips – these small pieces of paper indicating that you have spent the night in a place where they inform the government about all these strange things you do when staying with them. Nobody is interested in any customs declaration or wants do know what the hell we did with our foreign currency. 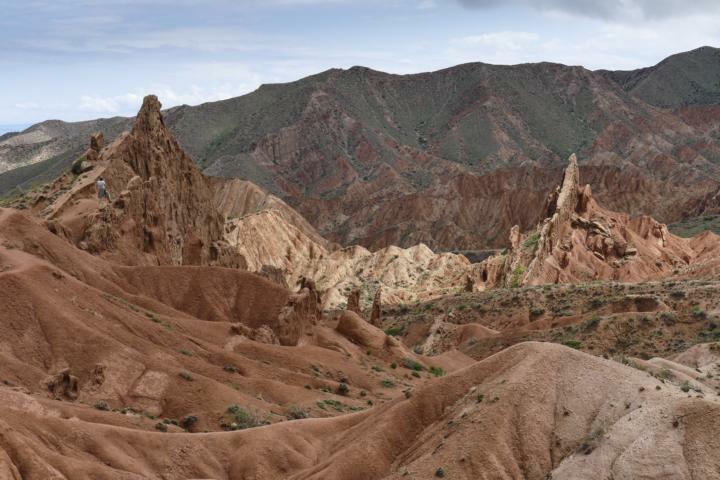 Then the Kyrgyz border. Just 15’, get the stamps, pay some 15 $ for something linked to environment and that’s it. Osh is adjacent to the border. So we directly enter the town. A world quite different to Uzbekistan. No longer these huge’n’empty representative streets. Just normal roads filled with parked cars, sometimes difficult to pass. Lots of shops and activities along the streets, a lot of people following all kind of businesses, etc. All much more animated, colourful and lively than this rather sterile atmosphere we often experienced in Uzbekistan. We head directly to the Tes GH. It seems to be the place everybody goes to. Time to exchange all kind of roadside tales or to develop new ones; we go to town to organise all we need in a new country, wash our clothes in a real washing machine, and finally have our 1st fat dinner in Kyrgyzstan. Hi Mike – about your very esteemed request to see more pics of Martin eating rotten overcooked chicken with fries in pure oil soup. Was searching in the local food scene. Couldn’t get any. Sorry for that. Maybe the closest to this delicacy I found on the pic on the right: a fast food eatery; also serving billy-goat hamburgers. The next morning a visit to MuzToo, a Swiss travel agency specialized on trips in the area. The place where we plan to leave the car for a few weeks when we take leave from our journey. 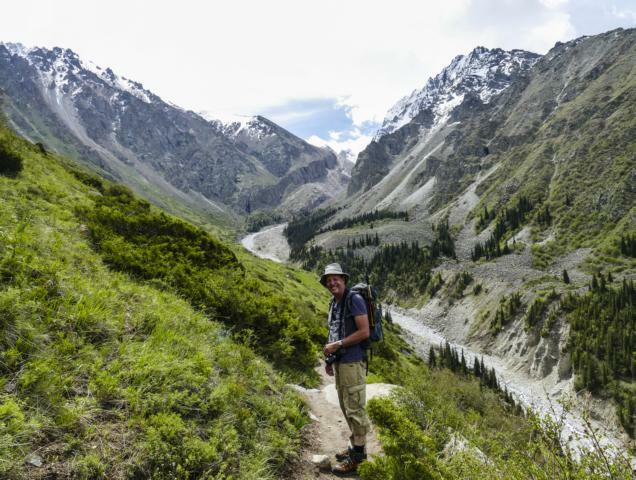 Many thanks to Patrik for all the information about the secrets of Kyrgyzstan’n’Tadjikistan and all these mountain roads which are currently closed due to landslides or broken bridges. Unfortunately also he has no news on the opening of the Nepal border. 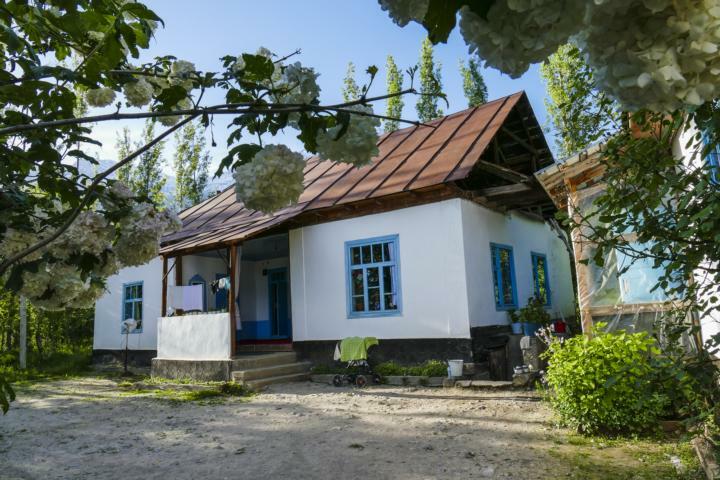 Then we move on to Arslanbob, a small village in the mountains famous for the world’s biggest walnut forest and the nice scenery. Some 200 km, 6h. Roads have slightly improved compared to Uzbekistan. But traffic is rather slow as the roads are winding, pass thru all villages and drivers are careful not to attract too much attention of the police. Arrived there we go to the Community Based Tourism office (looks like an exceptionally successful development project), select one of the homestays they offer and we find our place on top of the village. Of course 1st we have to have some tea, then a walk thru the village – we think we’re some 200 years back if there were not the old Lada Nivas roaring on their way thru the dusty alleys. Finally a visit to a waterfall and the walnut forest. 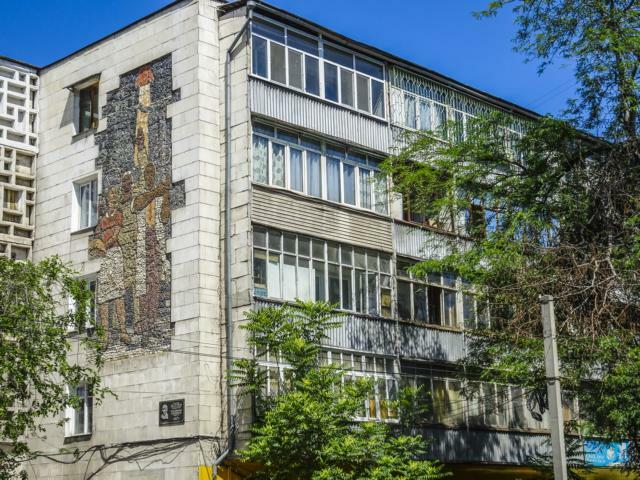 We still have to get our visa for Tajikistan in Bishkek. So we move on. 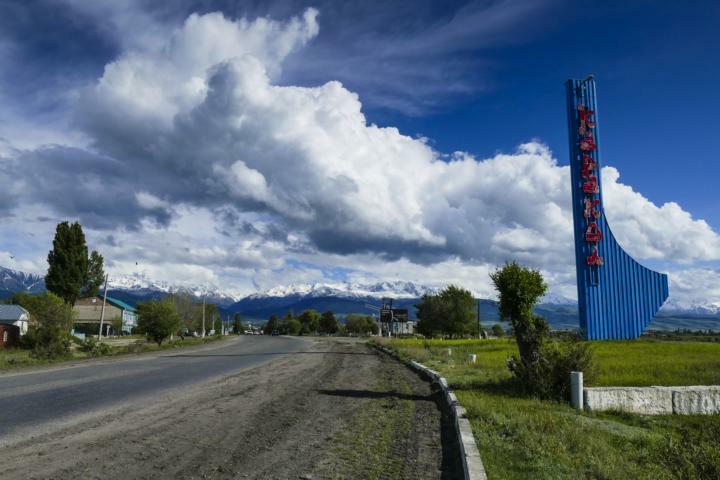 As the crow flies the proud capital of Kyrgyzstan is just 240km from Arslanbob. But 600km on the road – reminds us to Lesotho. A much too winding road, too many villages and too many trucks to make it in 1 day. So we start towards Toktogul. A small town some 300km, 6h away. We pass the world famous Mayluu Suu Valley – 1 of the world’s most polluted area. The place where an old Soviet uranium mine has polluted all watercourses with radioactivity – the same water Uzbekistan’s Fergana valley uses for agric. production. 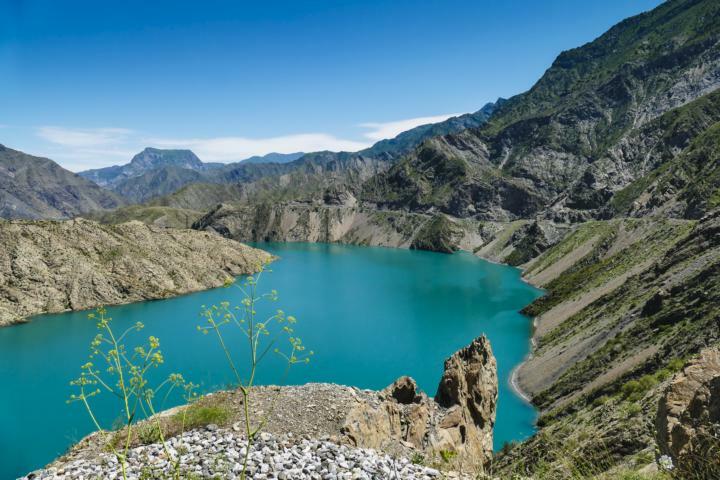 Then thru deep valleys along former coal mines and a number of water reservoirs to finally reach Toktogul. Toktogul, a small town in some distance from the eponymous lake. A place absolutely nothing to do except having a beer at the wonderful lakeshore. The 2nd day over 2 high passes. Unfortunately it’s pouring. Maybe a chance to have some snow. We climb to nearly 3200m to the Alabel Pass. Effectively the last few km thru snow. 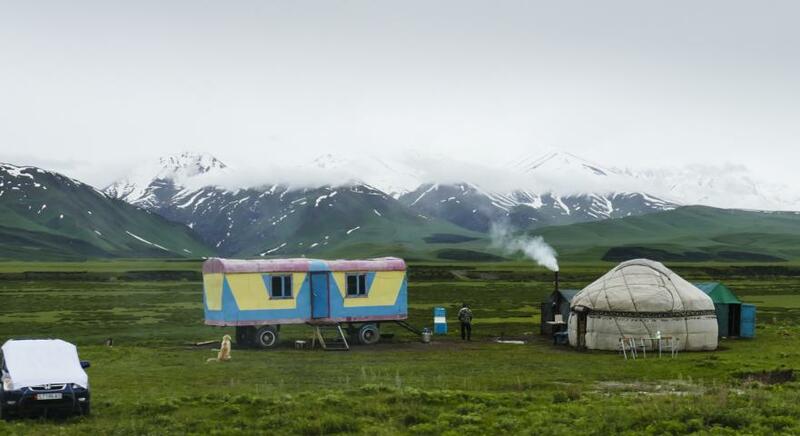 On the other side down to a plateau with a lot of yurts. Here we had 1 of these strange encounters you normally have if travelling thru the DRC. We come to a junction. A guy in uniform stops us: police. He just wants to see our documents – the usual stuff these guys are born for. Then it gets interesting. Of course nothing is wrong with our papers. We can see the guy’s brain starts smoking. So hard is he thinking about our illegal status. Of course he identifies exactly how to increase considerably his lousy salary. The driving license is not in Russian. The international one is in Russian, but the owner’s ID is not mentioned on each page and even worse a stamp is missing. The car’s documents are pretty ok even if not in Russian. Then he discovers the rooftop tent. We have no rooftop tent document, neither in Russian or any other language. The tent is even not mentioned in the car’s document. Definitely a reason for a huge penalty. Some 20’ later we have our documents back and we had an incredible chance to improve our Russian language. Somewhen the guy has realised that we’re not too amused about his penalties and we are either not too keen to support his life. We have a short discussion about the king of Switzerland, named Burkhard, because we showed him our driving licences of the Kingdom of Lesotho – sorry friends in Lesotho – and off we were. The next pass. Again some 3100m altitude. Now in thick fog. We can rarely see the road. Fortunately a dark, stinky tunnel on the top. Then again down to the Kyrgyzstan’s northern plain in endless hairpins. 2h later we’re back to civilisation in Bishkek. Just in time to relax in a nearby beer garden. 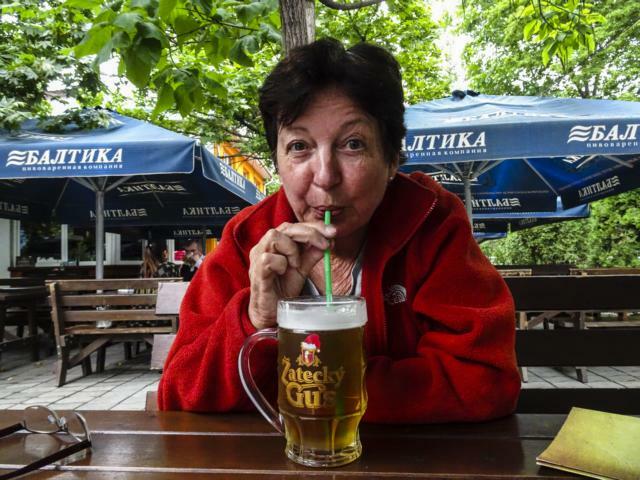 Kindly note, in Central Asia the elegant lady sips her beer with a straw. It’s not 1 of Monika’s quirks. 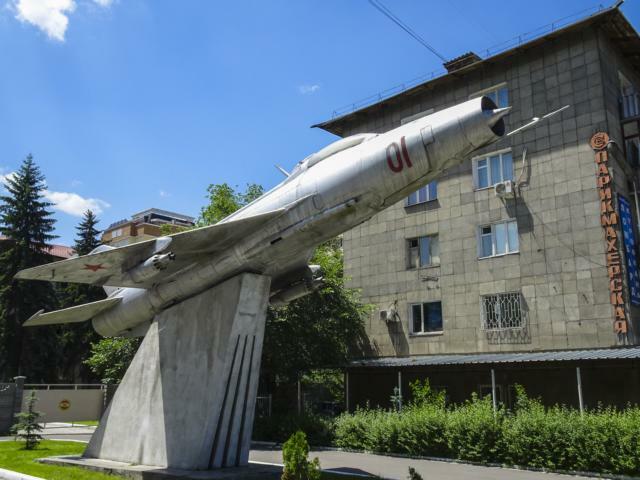 … and finally the special must-have-seen-sight if in Bishkek: the MIG-fighter on a concrete basement. Sorry, dear Kyrgies, but the last MIG in a similar position – the famous 1 in Hargaisa, Somaliland was more impressive with all these barbed guys slurping tea and chewing Kath beneath it. Once we’ve received our Tajikistan visa little to retain us in Bishkek. 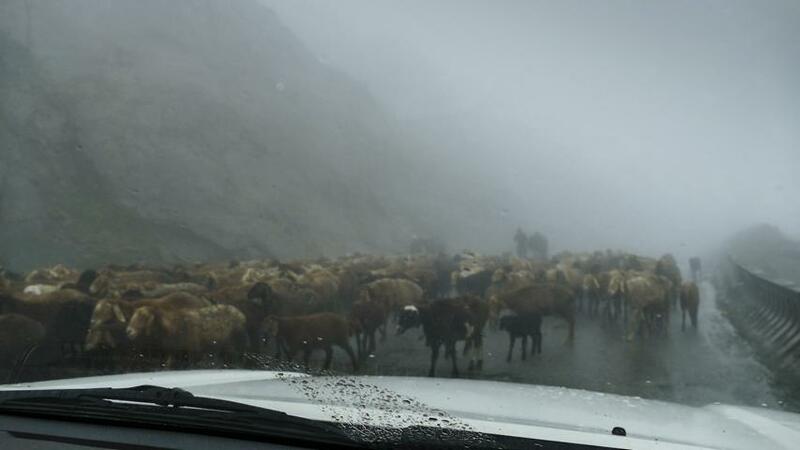 So we drive a few km south of the capital to the Ala Archa National Park. Not a huge choice of accommodation. 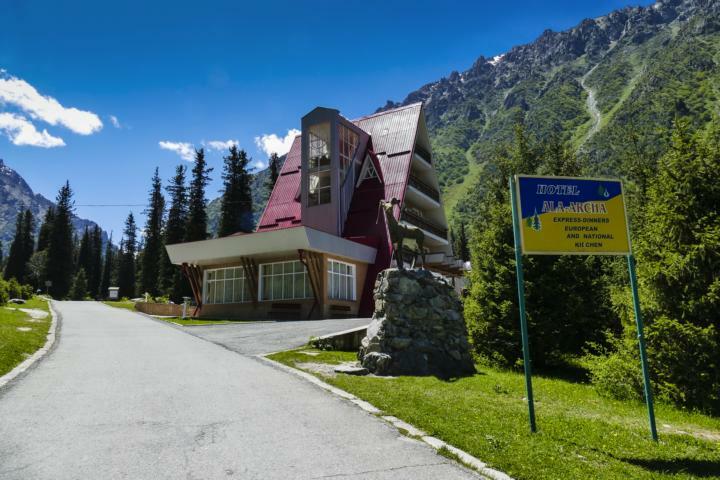 It’s too near to Bishkek, so only 1 hotel could survive – a renovated Soviet-brutalism-architecture-building in the middle of the beautiful mountain landscape. Time to discover the valley on a rather short hike. Nevertheless, some nice streams on the way to cool down the feet. … and a rather rainy way back. The next morning: a typical raindrop-counting-day. So we move on to Lake Issyk-Köl. To Kaji-Say on the southern shore. 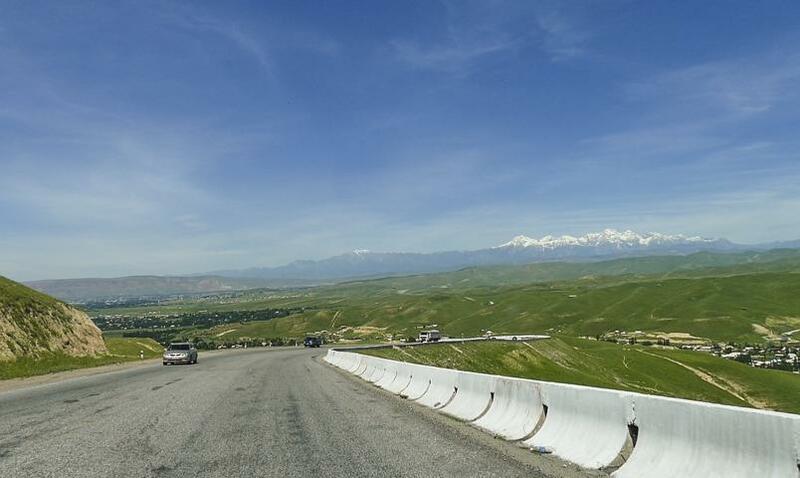 We take the small roads along the mountains to bypass wonderful Bishkek. 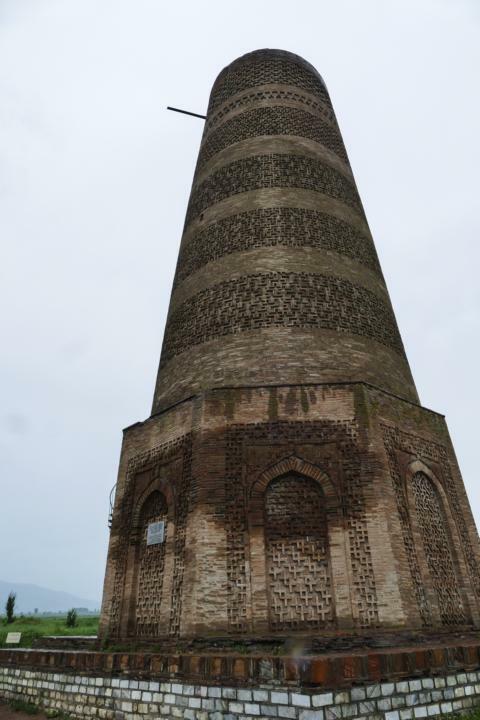 Have a look at the Burana tower, the only architectural monument in Kyrgyzstan from the heydays of the Silk Road trade – not very impressive. Maybe weather was just too wet. … and then along the lake. Some 350km, 6h. 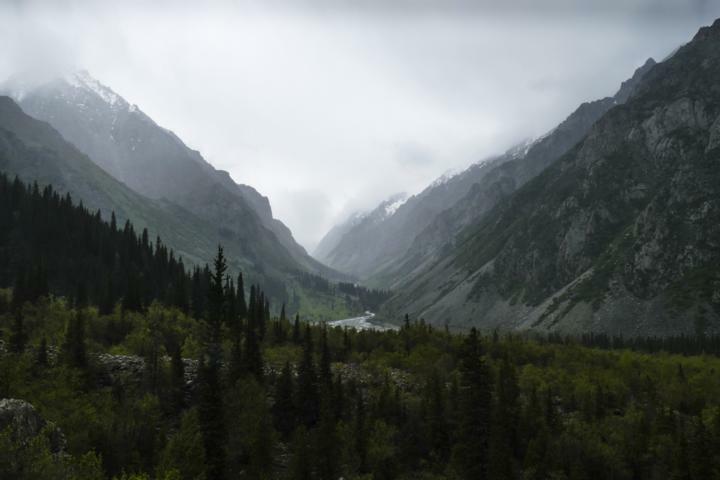 Effectively we didn’t see too much on the way – all foggy, cloudy, rainy, a little better along Lake Issyk. In Kaji-Say the whole village looks freshly washed. All roads still full of water, everywhere it’s dropping from the roofs – but the sun’s back. We take the small road to the Al Hayat Art GH. Prado has to do some real swimming exercises to get there. Nevertheless, the GH is very nice with a big garden filled with the owner’s collection and an art exhibition in preparation. A walk to Lake Issyk. Admiring the blue cold water and the loneliness of this early season evening. Difficult to imagine how it looks once all these Kazakh tourists sneak in during July to convert the beach to Ballermann. The next morning again grey weather, even if the owner of the guesthouse informs us that the area has yearly some 340 sunny days. Bad luck if we have 10% of the annual rainy days right now. 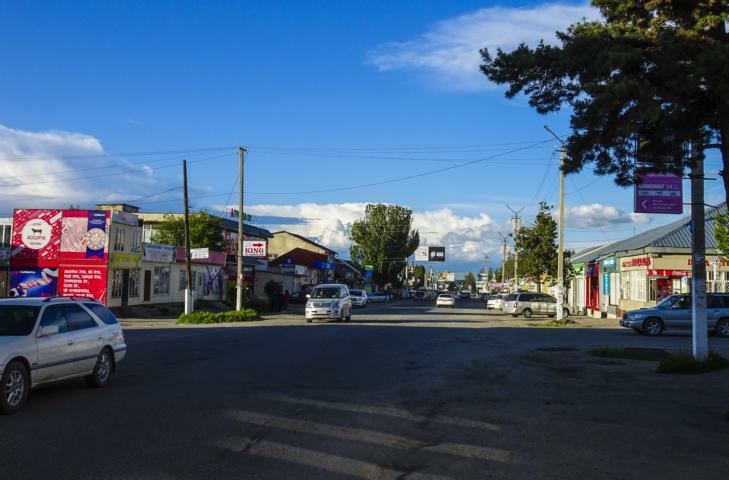 We drive on to Karakol. 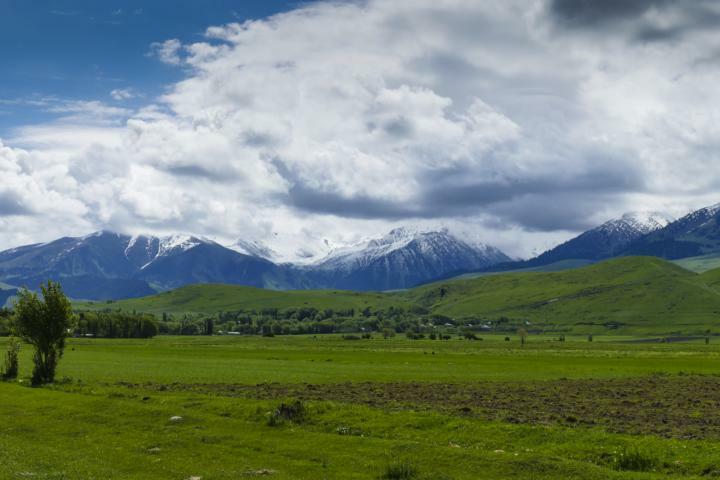 On the way a visit to Skaska – Fairy Tale Canyon. Not a long time ago 1 of these secret places roadside tales are made of. Nowadays an entrance gate where we pay a modest fee for whatever it may be used for. The canyon still blazing in all colours, but visibly the secret has been shared by quite a number of people; all leaving their marks. On to Karakol. Rather a village than a town. All looks a little unscripted. Somehow a kind of a frontier atmosphere. But still the best base to explore the surroundings and probably the town with the most beautiful background. There still a number of historical Russian building, the famous Chinese (Dungan) mosque and the Orthodox church. 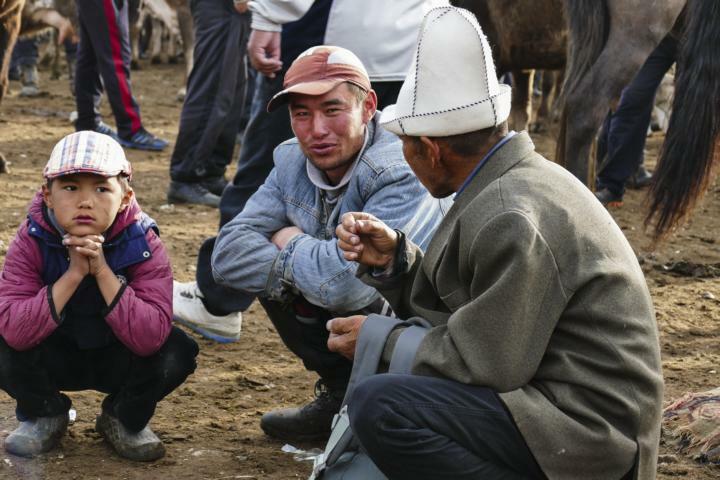 But the must-have-seen-sight of Karakol is the animal market on Sunday. A huge area a little outside the town to buy sheep, goats, cows, horses – name it you’ll find it. The sensation of course the famous fat-tailed sheep – a delicacy you have to be born with. … weather starts deteriorating. At 2800m snowfall starts. What a change to the dust in Uzbekistan. Further up. At 3400m we’re in the snow. Prado gasps slightly, definitely the air gets thinner. No problem, we just drive slightly slower. Still some 500m to climb to the pass. The road gets smaller, the snow on the side higher. Finally, we’re up. Time for a rest, to admire the surrounding and to get discovered by a guy from the army. Probably he doesn’t know how to speak to us. Once he has seen that we turned the car he disappears. 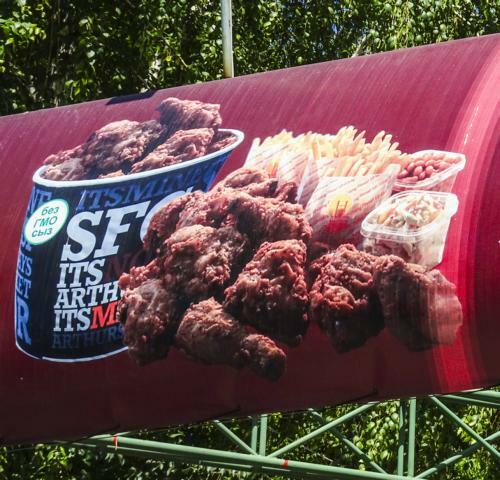 And finally – Martin’s special addition especially dedicated to Mike’s request to see him eating oily chicken with overcooked fries. 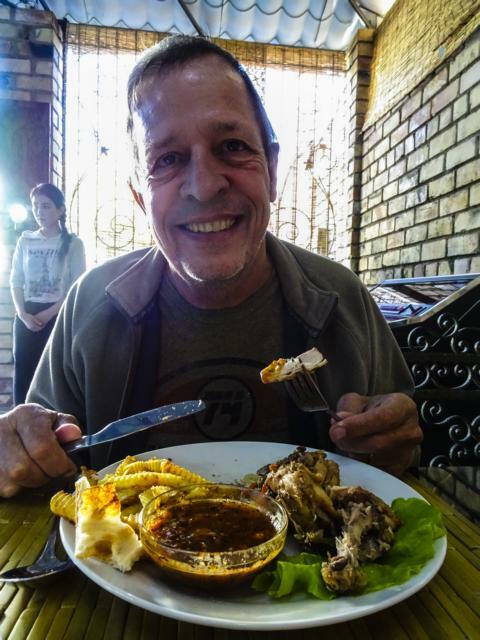 After incredible struggles, unbelievable efforts to manage all factors influencing such a request and incredible persistence to get a convincing result Martin got in the evening of 31st May 2016 this famous meal in the Al Hayat Art GH in Kaji-Say. Very different to these poor West African birds you find everywhere, this 1 was very tasty.